The Rhode Island file contains about 325 surname entries. 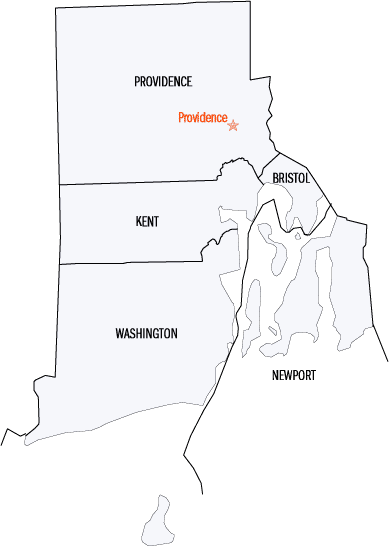 Rhode Island is the smallest state in size but developed a manufacturing base that attracted workers from England, Ireland and Scotland in that order. The first successful power-driven cotton-spinning jenny in North America started operating at Pawtucket in 1790 and the Slater Mill built in 1793 was the birthplace of the textile industry in the US. (This Mill has been preserved as a textile museum). The populaton of Daltons in Rhode Island was quite small but increased dramatically between 1870 and 1880. If you have data to contribute to this file, particularly of Canadian Dalton emigrants, it will be most welcome. Please use the section links, the "Find on this page..." button below, or the Edit/Find function of your browser to search. It is the onus of the user to verify the data. The Irish and English ancestry of Rhode Island Daltons who were enumerated in the 1880 Census is significant. Many were first generation. By the time a child reached 12 years of age he or she was either working in a cotton mill or in a screw manufacturing plant. Catherine Dalton, widow age 37, b. Ireland; three children b. RI - Elizabeth 16, John 14, and Mary C. 12. Lincoln. George H. Dalton, age 55, b. England, wife Sarah 55, b. England, Annie M. 23 b. RI. Lincoln. James Dalton, age 25, b. RI, parents b. Ireland, enumerated in residenceof Wm. F. Ryan, Providence. Mary Dalton, age 25 servant, b. RI parents b. Ireland, enumerated in residence of Alfred W. Fisk, Providence. SECTION II Daltons born in Rhode Island and enumerated in other states. Furgus Dalton age 38, b. England and wife Kate age 32 b. RI, parents b. Ireland. First two children b. RI - Thomas 9, and Mary E. 7; next three children b, NH - Georgia A. 5, Annie 3, and Gertrude 8 mos. Manchester, Hillsborough County. Susan Dalton, age 9, William Dalton age 7, Charles Dalton age 3, and Joseph Dalton age 1. Highland, Orange County. Daltons whose SS# was issued in Rhode Island and whose last residence was Rhode Island.